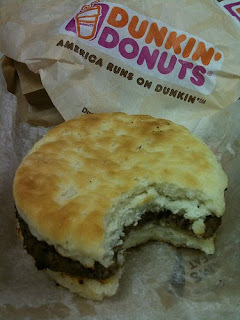 Choking Hazard: The $1.99 sausage biscuit special at Dunkin' Donuts is a dried out mess of processed foodstuffs. Keep a glass of water handy if you order this, because quick-thinking with hot coffee will turn your esophagus into a scalded food highway. Buen provecho. 99 cent hash browns are awesome. Don't mess with those flatbread sandwiches though. Ugh.